A day at the office is not what it used to be. If you’re picturing a room filled with cubicles separating big, boxy desks, your vision may be just a bit off. While there are still a few traditional office spaces like these out there in the white-collar world, mobile technology is fast morphing them into something else. Now, it’s just as likely your workstation will consist of a simple laptop stand instead of a bulky desk, a wireless network in lieu of cables and power strips galore for charging mobile phones, tablets and laptops. In fact, if you telecommute in from home every day, your workstation might even look much like a kitchen table. One standard remains, however — the office chair. Regardless of whether your job seats you at a drafting table for eight hours a day, or at your own kitchen table, you need an ergonomic, adjustable chair to get you through the day unscathed. 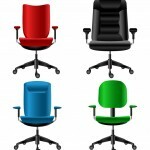 Ergonomic chairs are simply adjustable chairs that were designed with your comfort in mind. Most contain multiple paddles for adjusting everything from seat height to the amount of forward and backward tilt. If you spend hours a day in a seated position, you need the boost and support offered by an ergonomic office chair. Even if your workplace is still wired to the the 20th Century through such vintage office furniture as metal desks and cubicle walls, a cheap or outdated office chair is not something you should ignore. Your comfort, your posture and the state of your back, neck and legs at the end of the workday are at stake. Invest in an ergonomically sound work chair today.